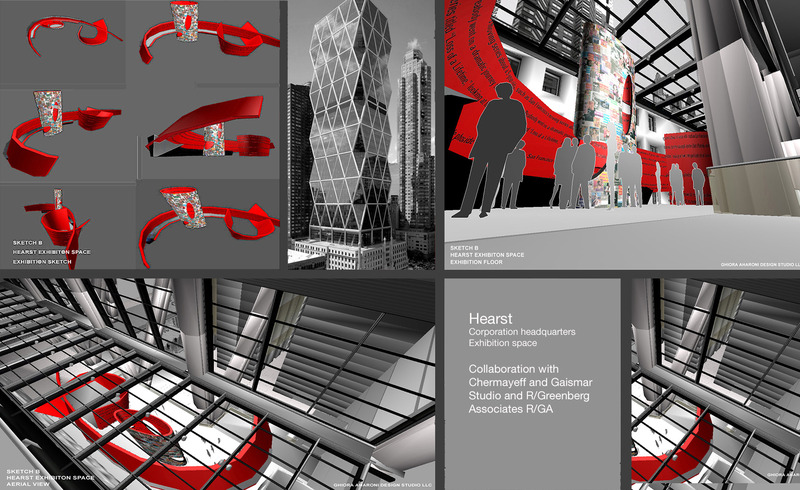 Located in the north mezzanine of Sir Norman Foster’s lauded addition to the Hearst Corporation headquarters in midtown Manhattan, the design for a 2200 square foot exhibition space reflects Hearst’s identity as both a forward-thinking media company and a historical publishing dynasty. Three curving and expansive exhibition structures, integrated with existing architectural elements, reference traditional script typography as well as evoke dynamism. A fourteen-foot high digital wall showcasing Hearst’s media properties curves along the northwestern perimeter and cantilevers above the lobby. Running along the base of the digital wall in a forty-foot long case are artifacts from the Hearst history. Representing the company’s evolution, a twenty-eight-foot high mesh family tree incorporates collaged media images from Hearst’s entities beginning with historical images at the base and moving upwards to the present.